If you've experienced a rash due to poison ivy, you might be reluctant to take your dog for another walk in the park, or wish you'd never tried to pull weeds without thick gloves and a protective suit. Instead of staying indoors, you can heal your itchy and inflamed skin with plenty of water, gentle care and topical creams and ointments. One of the most severe allergic skin reactions comes from a plant oil called urushiol released by poison ivy, poison oak and poison sumac. According to the Centers for Disease Control and Prevention, only 50 mcg of urushiol, or less than a grain of table salt, will cause a rash in 80 percent to 90 percent of adults. 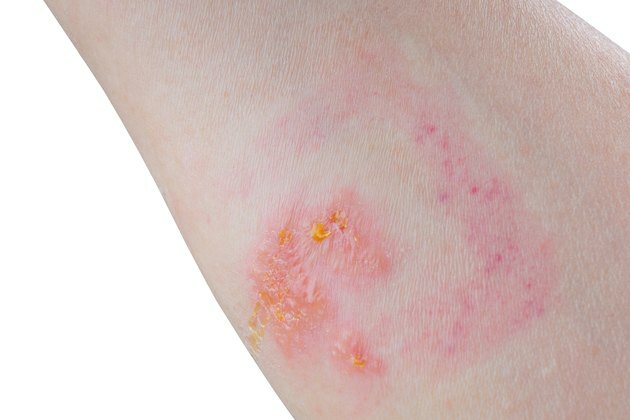 The itchy red poison ivy rash usually has bumps and fluid-filled blisters. You can significantly reduce later symptoms by getting rid of as much of the uroshiol as possible if you have been exposed. Immediately wash exposed skin with rubbing alcohol, degreasing soap such as dishwashing detergent, commercial plant poison washes, and plenty of water. Scrub under nails with a brush, because tiny amounts of the oil can remain underneath them and cause re-exposure. Several creams and lotions are effective for reducing the itching associated with poison ivy rash. Some creams also reduce swelling and help protect irritated skin. Over-the-counter cortisone cream or gel reduces swelling and itching. Calamine lotion contains chemicals that reduce itching and also help to dry out broken skin and blisters from the rash. Some calamine and cortisone lotions and creams also contain aloe vera, which also soothes itching, burning skin. Cool baths with a colloidal oatmeal solution can relieve and reduce poison ivy itching and rash. The National Institutes of Health also recommends aluminum acetate solution, found in drugstores as astringent solution packets for the bath, or as a cool compress to relieve itching and swelling and to help dry out broken blisters. Because poison ivy rash is an acute or sudden allergic reaction, antihistamines can relieve itching, swelling, and redness. CNN Health advises that the antihistamine diphenhydramine can help you sleep in addition to helping reduce the rash.